Recombinant fragment within Human MLKL aa 350 to the C-terminus. The exact sequence is proprietary. WB: HUVEC and HT-29 whole cell lysates; Human fetal kidney lysate. IHC-P: Human tonsil and colonic adenocarcinoma tissues. Our Abpromise guarantee covers the use of ab184718 in the following tested applications. WB 1/1000. Detects a band of approximately 54 kDa (predicted molecular weight: 54 kDa). IHC-P 1/400. Perform heat mediated antigen retrieval with Tris/EDTA buffer pH 9.0 before commencing with IHC staining protocol. Lanes 1 - 4: Merged signal (red and green). Green - ab184718 observed at 55 kDa. Red - loading control, ab8245, observed at 37 kDa. 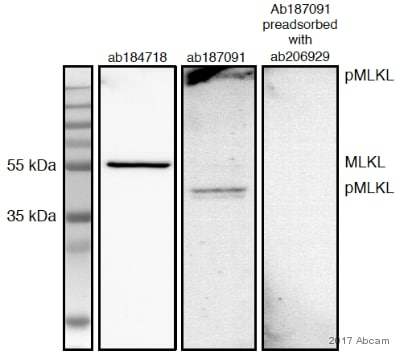 ab184718 was shown to recognize MLKL in wild-type HAP1 cells along with additional cross-reactive bands. No band was observed when MLKL knockout samples were examined. 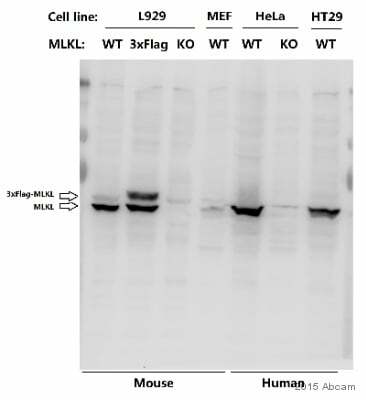 Wild-type and MLKL knockout samples were subjected to SDS-PAGE. ab184718 and ab8245 (loading control to GAPDH) were diluted to 1/1000 and 1/2000 respectively and incubated overnight at 4°C. Blots were developed with Goat anti-Rabbit IgG H&L (IRDye® 800CW) preadsorbed (ab216773) and Goat anti-Mouse IgG H&L (IRDye® 680RD) preadsorbed (ab216776) secondary antibodies at 1/10,000 dilution for 1 hour at room temperature before imaging. Ab184718 staining MLKL in HT-29 (Human colorectal adenocarcinoma epithelial cell) cells by Immunocytochemistry (ICC). Cells were fixed with 100% Methanol. Samples were incubated with primary antibody at 1/200 dilution (6.5μg/ml). An AlexaFluor® 488 Goat anti-Rabbit (ab150077) was used as the secondary antibody at 1/1000 dilution (2μg/ml). Ab195889 , Anti-alpha Tubulin antibody [DM1A] - Microtubule Marker (Alexa Fluor® 594) was used as the counterstain antibody (1/200 dilution, 2.5 μg/ml . DAPI was used as a nuclear counterstain. 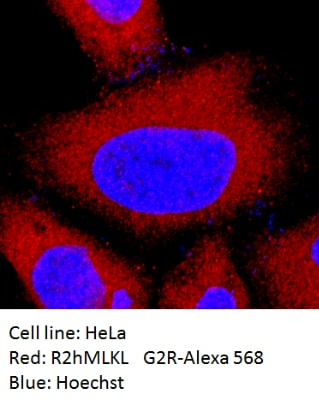 Confocal image showing cytoplasmic staining on HT-29 cell line. Immunohistochemical analysis of paraffin-embedded Human tonsil tissue labeling MLKL with ab184718 at 1/400 dilution, followed by Goat Anti-Rabbit IgG H&L (HRP) secondary antibody (ab97051) at 1/500 dilution. Cytoplasmic staining on the lymphocytes of human tonsil is observed. Counter stained with Hematoxylin. 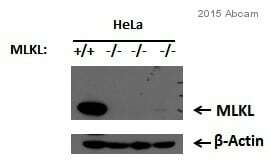 Negative control: Using PBS instead of primary antibody, secondary antibody is Goat Anti-Rabbit IgG H&L (HRP) (ab97051) at 1/500 dilution. Immunohistochemical analysis of paraffin-embedded Human colonic adenocarcinoma tissue labeling MLKL with ab184718 at 1/400 dilution, followed by Goat Anti-Rabbit IgG H&L (HRP) secondary antibody (ab97051) at 1/500 dilution. Cytoplasmic staining on tumor cells of human colonic adenocarcinoma is observed. Counter stained with Hematoxylin. Publishing research using ab184718? Please let us know so that we can cite the reference in this datasheet.